Move over Korn. Montreal's Skip the Foreplay have been developing a buzz for themselves by mixing mosh riffs and guttural grunts with synth-heavy Euroclub culture and wobbly dubstep drops, and it looks as if the genre mashing has worked in their favour. The band have just announced that they've signed with venerable punk mecca Epitaph Records. "We're extremely proud to announce that we're now part of the Epitaph Records family," the group revealed on their Facebook page this morning (December 7). "Being on a label amongst bands like New Found Glory, BMTH, Every Time I Die and Converge is a huge honour." Label founder/president Brett Gurewitz, meanwhile, praised his latest signing both for their brutalized dance tunes and their no-nonsense moniker. "Aside from having one of the greatest names in history, Skip the Foreplay are simply Satan's delivery system for music of mass destruction," he said in a statement. While neither a release date nor a tracklisting has been unveiled for Skip the Foreplay's debut disc, tentatively titled Nightlife, we do know that the LP has been completed and was recorded by Frank Shooflar at Montreal's Bird Wazo Studio. 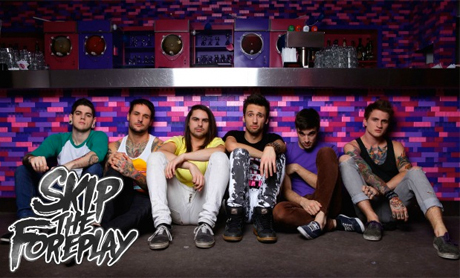 In the meantime, check out the band's heavy take on LMFAO's "Champagne Showers" below. The Quebec outfit also announced that they'll be hitting the road as the opening act for now-labelmates Falling In Reverse's upcoming tour. While no Canadian dates are scheduled, you can check the schedule below.